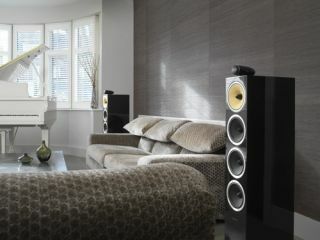 B&W launches flagship CM10 floorstanding speaker for £2999 a pair | What Hi-Fi? New from Bowers & Wilkins is the CM10 floorstanding speaker, the flagship model in its CM Series. Available in four finishes, the CM10 features a new tweeter design, a decoupled FST midrange driver and three bass drivers. It's also the first model in the CM Series to feature a 'tweeter-on-top' configuration, a hallmark of the much pricier B&W 800 Series Diamond. The new CM10 tweeter dome is based in part on the research conducted on the carbon-braced tweeter used in the B&W PM1 speaker. Here, the edge of the aluminium dome is strengthened using a second aluminium layer, creating a new 'double-dome' design. B&W says this approach stiffens the whole structure and prevents the voice coil from going 'out of round' at higher frequencies. The cabinet height of the CM10 is the same as that of the CM9 model, but by adding just a little depth to the enclosure and relocating both the tweeter and FST midrange drive units, there's sufficient space for an additional bass drive unit. What's more, the CM10's Kevlar FST driver is decoupled from the rest of the cabinet to help reduce audible cabinet coloration. All these improvements combined mean the CM10 can play louder and go deeper than the CM9, claims B&W. The B&W CM10 will be available from September at £2999 a pair, in two real-wood finishes, Rosenut or Wengé, or two painted finishes, Black Gloss or Satin White.